To break the 'lull' surrounding 3 months of my inactivity, lets start with the blast i have been having playing the Wii. I have never been a serious gamer and gaming consoles have always ranked low on my wish list. But the Wii changed all that in an instant - zap! I almost bought a PS3, partly for its next-gen blu-ray player. 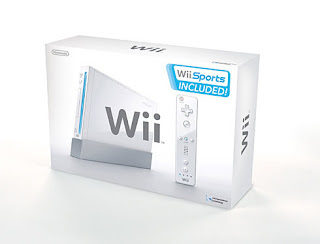 When the Wii was launched last November, the whole internet was abuzz with its distinguishing, motion sensing wireless controller. Some of my colleagues who are early game adopters were all praise for it. Did a couple of back and forths, as i always do, and was ready to jump on the Wii bandwagon. ...and after that determination can you guess how long it was before i could wrap my hands around a Wii - 3 whole months..no kidding. Countless late night trips, early morning calls and frustration ended when a Best Buy store 45 mins away had 10 in stock. My excitement was that of a one year old who had just received his favorite candy...ahh...so long. With the Wii, its a whole new world. Everyone who picks it up is an instant expert. It's as close to having pure fun as it gets...hours of addictive play and tons of simple pleasurable joy. Along with the bundled Wii Sports, I have been playing The Legend of Zelda: Twilight Princess and Super Mario Galaxy and my only complaint - 24hrs in a day are sufficient no more ! Nintendo's vision of reaching out to once disinterested gamers is all but accomplished and a whole year after its release, you still see people complaining about not being able to find the Wii - a true testament to its reach and popularity. Such is the power of an idea.. a 'revolution' in the true sense of the word. Yo Mr. Maranani.. Rajesh here.. enti.. Wii tho busy aa.. stopped bloggin???? I like your blog man.. keep updating..